Got a Heavy Haul to Move? Call Great Western Transportation! With Great Western Transportation, you don’t have to invest in the equipment you only need to transport supplies and equipment to the next job. No matter where your company, or job site, is located, we have a nationwide network to expedite transit times. Our pricing is extremely competitive, and we strive to deliver the best in customer service. Heavy hauling shipping can require special trucks and trailers equipped to move the load size you need to be moved. We know the route restrictions for heavy hauls. Not to mention the various permit requirements that vary between states, cities and other municipalities. There are more requirements with heavy hauling to include: flags, lights, signs, holiday restrictions, and even running times allowed per state. Moving heavy haul loads without the proper trucks, trailers, and permits can leave your company with devastating fines, as found on Truckers Report, “$57,000.00”! 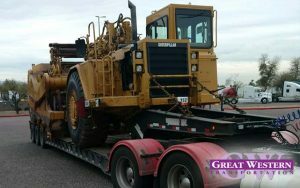 The team at Great Western Transportation will never allow a load to move without proper permits and approvals. The Commercial Vehicle Safety Alliance (CVSA) has been holding annual road checks throughout North America since 1988. This year’s three-day inspection period is set for June 4-6, 2019. At Great Western Transportation, we take safety very seriously, and your loads will be shipped with extreme caution as the CVSA requires. The team at Great Western Transportation is here to take the heavy-haul headaches out of your project planning. When you need our service, your equipment is on the move shortly after you have approved of our quote, and the details are confirmed. We make it easy for you to spend your time getting your project underway and on to the next. 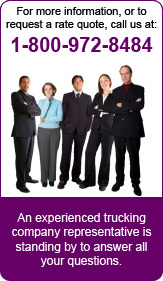 We’re always happy to be your complete trucking service.